Affective or mood disorders are characterized by various types of psychiatric diseases that can be disruptive to a patient's life. They can involve abrupt onsets of manic or depressive episodes of mood changes and often combinations of the two. Patients usually experience depressive episodes of agitation, sleep disturbance, eating disturbances, lack of interest and feelings of worthlessness or guilt. The mania is usually associated with violence to others. Psychotherapy, medical treatment or even electroconvulsive therapy in extreme cases are the mainstay treatment of affective disorders. Affective disorders are episodically occurring psychiatric diseases. Any of several psychological disorders characterized by abnormalities of emotional state and including especially major depressive disorder, dysthymia, and bipolar disorder is called affective disorder. 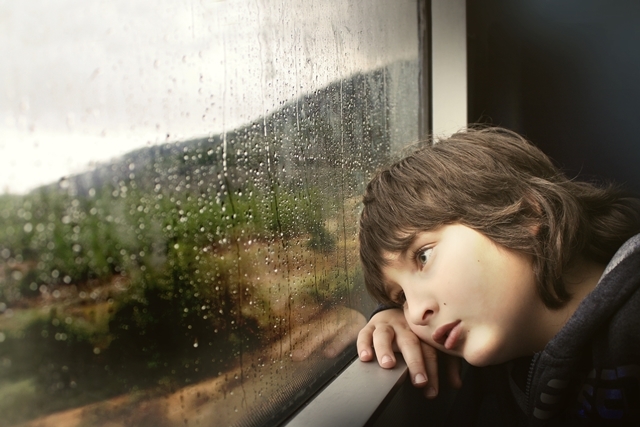 The main types of affective disorders are depression, bipolar disorder, and anxiety disorder. According to the quality and the direction of the mood amplitude, affective disorders are categorized as unipolar and bipolar disorders. Unipolar disorders refer to deflections of mood in one direction only, usually downwards (depressive episodes). Bipolar disorders, however, include not only the downward deflection but also manic or hypomanic episodes. These are episodes with an extremely elevated mood level. So bipolar disorders are characterized by two different mood deflections. Beside the ICD-10, the American DSM (Diagnostic and Statistical Manual of Mental Disorders) is also an important point of reference for the classification of psychiatric diseases. This is especially for the understanding of current research. It is absolutely necessary to be familiar with the DSM. Unipolar affective disorders are all depressive diseases. They include single depressive episodes, recurrent depressive disorder, and dysthymia. Actually, purely manic symptoms would have to be considered unipolar as well. However, this is highly uncommon, so manic episodes are usually attributed to a bipolar disorder. The depressive episode describes the presence of depressive symptoms. The diagnosis according to DSM-V as well as ICD-10 is based on major and minor criteria. This includes that over a time of at least two weeks, unusually negative mood levels and loss of joy and interests have to dominate for most parts of the day. The severity of the episode depends on how many symptoms occur simultaneously. In the ICD-10, the severe depressive episode is additionally characterized by the presence or the absence of psychotic symptoms. Depressive symptoms are manifold. Next to affective symptoms, changes in the cognitive, behavioral, and somatic level are possible. The first depressive episodes usually occur in young adults between the ages of 25 and 35. it is more prevalent in females than males. Rate of depressive episodes donot differ markedly by race. If left untreated, an episode lasts for roughly three to four months and then remits completely in 70—80 % of the cases. In the other 20—30 %, residual symptoms remain for months or even years. The more frequently a patient suffers from depressive episodes, the greater the probability that symptoms persist. Point prevalence of depressive symptoms is approximately 8.1 % (women: 10.2 %; men: 6.1 %). Unfortunately, the first depressive episode is very often not the only one. One-third of the patients experience clearly definable episodes of major depression over and over again. For another third, the episodes are chronic and proceed with only partial or no remission. The more frequently the episodes occur, the greater is the probability for re-occurrence. It is estimated that 11.6 % of the adult German population suffer from a depressive disorder at some point in their lives (women 15.4 %; men 7.8 %). Depression affects more than 15 million American adults, or about 6.7 percent of the U.S. population age 18 and older in a given year. The median age at onset is 32.5 years. Persistent depressive disorder or PDD, (formerly called dysthymia) is a form of depression that usually continues for at least two years. Affects approximately 1.5 percent of the U.S. population age 18 and older in a given year. (about 3.3 million American adults). The median age of onset is 31.1 years. Dysthymia is not a complete manifestation of major depression; symptoms present in a less severe form over a period of at least two years. This would include, for example, a continuously subdued mood and loss of joy and interests, but functionality in occupational life would be retained. In addition to dysthymic symptoms, ‘actual’ depressive episodes might occur. This is then called a double depression. Life prevalence is estimated to be 2.5—6 %. Point prevalence in 2011 was estimated to be 2.0 %. PDD often begins before the 20th year of life and lasts five years on average. The development of a unipolar affective disorder is not monocausal. It is rather an interaction of numerous predisposing factors and events. 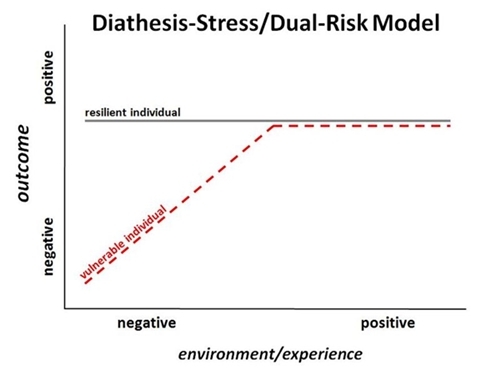 The standard explanatory model is the diathesis-stress model, which tries to explain the interactions of different influences and the formation of the disease. Different biological, psychosocial, and psychodynamic factors are discussed as influencing factors. Genetic predisposition has a moderate influence on the development of a unipolar affective disorder. However, this relationship does not distinctly show in the chronic unipolar disorder (PDD). Furthermore, several elements play a role, such as disorders in the neurophysiological system, a strong activation of the hypothalamus pituitary adrenal axis (HPA axis) with increased release of cortisol, neurobiological changes (decreased volume of the orbitofrontal cortex, hippocampus; elevated activity of the amygdala), reduced phases of deep sleep, and longer nights (seasonal affective disorder, ‘winter blues’). Psychosocial circumstances that can cause depressive symptoms to include stress triggering events, individual vulnerability, personality, and social support. Psychodynamic models assume an early development and permanence of dysfunctional schemes and beliefs or acquired helplessness. 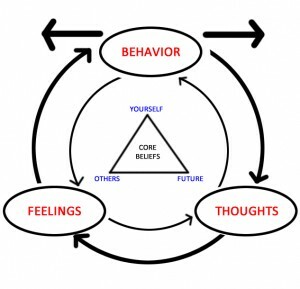 This leads to negative thought spirals and beliefs, which are a key characteristic of depressions. Further risk factors for the development of a depressive episode are age, gender, and socio-economic status. For example, the highest prevalence can be found in the age group of 18—29 and in subjects with low socioeconomic status, according to a German study on adult health. Generally, women are affected almost twice as much as men. Further risk factors are, as mentioned, stressful life events (like, e.g., experiencing traumas), living single, and pre-existent comorbidities. Comorbidities can be of psychic (e.g., anxiety disorders, substance disorders) and somatic nature (diabetes mellitus, CHD). There is no specific cause-effect direction since depressive symptoms can be both the cause and the consequence of other diseases. If you are not a psychiatrist, it is not always easy to recognize depression. Often, patients report unspecific physical symptoms like back and/or abdominal pain. This is called a ‘somatic depression’. If, for example, referrals to different medical specialists or consultations about symptoms that cannot be explained somatically become overly frequent, the general practitioner should consider depression. Then, he/she should cautiously inquire about mood and energy level and general ability to experience joy in the past four weeks. Also, there are easy screening questionnaires that facilitate the assessment if depressive symptoms are present or not. Even if the patient does not experience a negative mood, it is generally possible that inexplicable somatic symptoms can be caused by a depression. In this case, this is called masked depression. In approximately one-third of patients with a unipolar disease, the diagnosis has to be changed to a bipolar disorder in the further progression of the disease. Bipolar disorder II is the easiest to miss and be underestimated in regard to its frequency. This is because hypomanic symptoms are experienced as pleasant and are therefore not reported by the patient himself or are not asked for at all. Bipolar disorder is also an affective disease. It is characterized by a recurrent change of mood between the poles of (hypo)mania and depression. It cannot be influenced voluntarily and at times both extremities can be present at the same time (mixed episode). Between the individual episodes, there are symptom-free (euthymic) intervals. If the affective episodes change in quick sequence with at least four definable episodes in a year, this is called rapid cycling. The ICD-10 describes a manic episode with elevated, elated, or irritable mood. It is perceived by the affected person as a significantly abnormal mood level. This change in mood must dominate and last for at least one week (unless hospitalization becomes necessary). Additional features (at least three or four if the mood is only irritable) have to be present and the daily routine has to be severely disturbed. Manic symptoms are for example, increased activity or motor restlessness, increased talkativeness, flight of ideas, or the subjective feeling of rushing thoughts, loss of normal social inhibition, which leads to inappropriate behavior, decreased need for sleep, inflated self-esteem or megalomania, distractibility or continuous change of activities and plans, daring or reckless behavior whose risks are not recognized by the affected person, and increased libido or sexual indiscretion. During mania, less sleep and feelings of exaggerated self-confidence, irritability, aggression, self-importance, impulsiveness, recklessness, or in severe cases delusions or hallucinations are exhibited in Affective disorders. In hypomania, these symptoms are less extreme and distinct, but noticeably ‘different’ than normal for the affected and (even more often) for the environment. After a certain time, the mood shifts and the patients slide into a depressive episode. Different from the ICD-10, the DSM differentiates between bipolar disorder I, bipolar disorder II, and cyclothymia. In contrast, the ICD-10 only codes the currently present episode. Bipolar disorder I is characterized by the occurrence of one or several manic episodes and episodes of major depression (= mania + depression). Bipolar disorder II is characterized by the occurrence of recurrent episodes of alternating major depressions and hypomanic episodes (= depression + hypomania). Cyclothymia describes a milder form of bipolar disorder. Similar to dysthymia, changes in the mood level can be observed over a longer period of at least two years. However, the criteria of a (hypo)manic or depressive episode are not completely met. Lifetime prevalence of bipolar disorders is estimated to be 3.9 to 4.4 % (bipolar disorder I: 1 %, bipolar disorder II: 1.1 %). The onset of bipolar disorders mostly occurs in the teenage or young adult age. The gender proportion is balanced for bipolar disorder I; bipolar disorder II is more frequent in women. The pathogenesis of bipolar disorders is not completely understood. A multifactorial genesis is assumed. As for unipolar disorders, the diathesis-stress model provides a basis for understanding the development of bipolar disorders. Genetic disposition leads to increased vulnerability for the development of the disease. Besides this, environmental factors such as biographical events, coping strategies, drug consumption, stress, and other factors play a role in the development of the disease. Stressors, which are not necessarily of a negative nature, can trigger an initial phase. For example, the birth of a child is often a trigger of bipolar disorders in women. Subsequent phases, however, often occur without a relatable event. Seasonal Affective Disorder (SAD) is a syndrome typically used to describe a recurrent, seasonal pattern of depressive episodes. SAD may also describe other affective episodes (mania or hypomania) that occur in a seasonal pattern. SAD is considered to be a relatively common disorder. The prevalence of SAD tends to vary across populations. In the United States, prevalence estimates range from 0.4% to as high as 10% depending on the methodology being used. SAD seems to affect women more commonly than men (4:1 ratio) and appears to decrease in prevalence with age. Winter-onset SAD is more common (often characterized by atypical depressive symptoms including; hypersomnia, increased appetite, and craving for carbohydrates). On the other hand, spring/summer also seen and is more frequently associated with insomnia and loss of appetite. It has been estimated that 67% of those diagnosed with SAD will face recurrence the following winter, and after 5–11 years 22–42% of patients will still be suffering from SAD, 33–44% will develop non-seasonal depressive episodes, and remission is seen in approximately 14–18% of patients. Diagnosis of bipolar disorders can only be traced by longitudinal observations if at least two different definable affective episodes have occurred over the course of time. The diagnosis of bipolar disorder I is relatively easy due to its conspicuous manifestations. It is assumed that a part of unipolar depressive patients should rather be classified as bipolar disorder II; however, the assessment of hypomanic symptoms is difficult. This is because they are experienced as pleasant by the patient and are seldom reported spontaneously. Unipolar and bipolar disorders are frequently accompanied by other mental and somatic diseases. Frequent psychiatric comorbidities are anxiety disorders, substance abuse, and addiction, and impulse control disorders. On the somatic level, diseases of the cardiovascular system and the endocrine system like diabetes mellitus and the metabolic syndrome are frequently observed. But also musculoskeletal diseases and migraine often accompany the affective disorder. Mortality due to cardiovascular diseases is double or triple. Generally, mortality due to increased suicide risk is increased. It is estimated that approximately 15 % of affective patients commit suicide. Treatment and the objectives of treatment differ for unipolar and bipolar disorders in several aspects. In treating unipolar affective disorders, symptom reduction is the priority. The treatment of bipolar affective disorders is aimed at the elimination of episodes. This requires mandatory medication, whereas a milder unipolar depressive episode can be treated with alternative measures. The treatment objective for unipolar depressive disorders is the reduction of the occurring symptoms and reaching a complete remission with the rehabilitation of occupational and psychosocial performance as well as mental balance. Another objective is to avoid recurrence. Important pillars of treatment for unipolar affective disorders are a medication with antidepressants and psychotherapy. There are various different substances that are used as antidepressive medication. The most important are tri- (and tetracyclic) antidepressants (TCA), the selective serotonin-reuptake-inhibitors (SSRI), the selective serotonin-and-noradrenalin-reuptake-inhibitors (SSNRI), and the selective noradrenalin-reuptake-inhibitors (SNRI). Further antidepressive substances are, for example, the selective noradrenalin-dopamine-reuptake-inhibitor bupropion or the serotonin 5-HT2C-receptor-antagonist agomelatin. All antidepressants need some time to unfold their full effect. Additionally, side effects complicate the initial phase. This difficult time should then be cushioned therapeutically since the risk for the patient to abandon therapy is especially high in this initial phase. The most prescribed antidepressants are of the class of the selective serotonin-reuptake inhibitors (SSRI). Representatives of SSRI are fluoxetine, citalopram, escitalopram, fluvoxamine, paroxetine, and sertraline. The SSRI increases the amount of serotonin in the synaptic cleft through the inhibition of reuptake transporters. They often lead to gastrointestinal complaints like nausea and sexual function disorders. However, they generally have fewer side effects than the tri- and tetracyclic antidepressants since they do not block any other receptors. Tricyclic antidepressants (TCA) unfold their effect through the inhibition of the re-uptake of serotonin and noradrenaline from the synaptic cleft. Additionally, they block several receptors (e.g., central and peripheral cholinergic, histaminergic, or alpha1-adrenergic receptors), which can cause a series of side effects, as for example cardiovascular symptoms (orthostatic hypotension, stimulus conduction disorders, tachycardia). Representatives of the TCAs are amitryptiline, imipramine, and clomipramine. Selective serotonin and noradrenalin-re-uptake-inhibitors (SSNRI) inhibit the re-uptake of serotonin and noradrenaline. This way, the concentrations of serotonin and noradrenaline in the synaptic cleft are increased. Known side effects are the loss of appetite, nausea, obstipation, mouth dryness, sexual function disorders and restlessness, sleeping disorders and in case of higher dosages, hypertension. Representatives of SSNRIs are venlafaxine and duloxetine. The selective noradrenalin-reuptake-inhibitors (SNRI) block the reuptake of noradrenaline from the synaptic cleft and therefore increase its concentration. Side effects are triggered by the noradrenergic effect, which is why this treatment also leads to increased mouth dryness, sexual dysfunction, and sleeping disorders. A common representative of SNRIs is reboxetine. The overall objective in treating bipolar disorders is the elimination of episodes. Further goals are maintaining or regaining a psychosocial functional level as high as possible. For treating bipolar disorders, long-term medication is absolutely necessary, which can be supplemented by further treatment measures like socio-therapy. A distinction is made between acute treatment and phase prophylaxis. In acute treatment, the goal is to decrease symptoms of maniac, hypomanic, depressive, or mixed episodes. This is achieved by administering the appropriate medication, such as antidepressants, typical and atypical neuroleptics, mood stabilizers, and benzodiazepines. Typical and atypical neuroleptics that play an important part in treating a manic phase are, e.g., quetiapine, clozapine, or risperidone. Furthermore, benzodiazepines like lorazepam are used for curbing the manic behavior. Antidepressants are used for treating an acute depressive episode. There is the possibility that the intake of an antidepressant may trigger a so-called ‘switch’. In this case, the patient experiences a mood shift from an acute depressive episode to an acute manic episode. Predisposing medicaments for a switch are TCA and SNRI. In phase prophylaxis, the renewed occurrence of an episode is tried to be avoided or delayed. Besides mood stabilizing medication such as lithium, valproic acid, carbamazepine, and lamotrigine, other therapeutic procedures like psychotherapy or psycho-education can be utilized. The personal environment should always be included in treatment since relatives often recognize the first symptoms earlier than the affected person him-/herself. Well-proven is the efficacy of cognitive behavior therapy (CBT) as treatment of affective disorders. 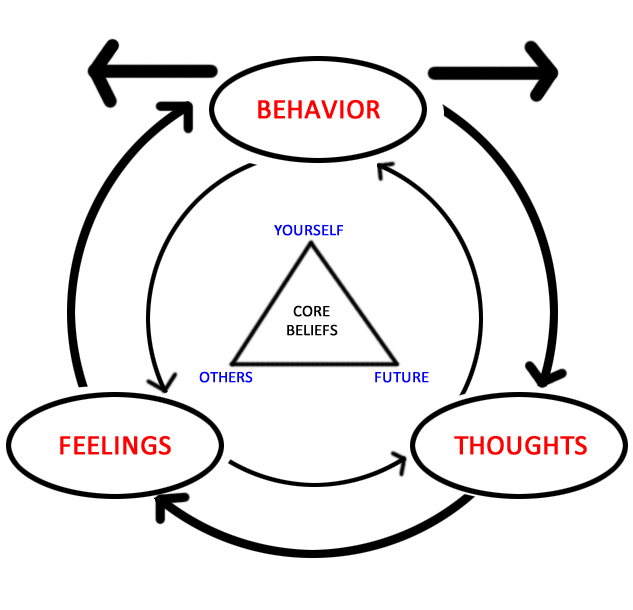 CBT aims to make the relations between thoughts, feelings, and behavior more conscious. The goal is monitoring and correcting dysfunctional attitudes and, for instance, building up activity step-by-step. In the treatment of bipolar affective disorders, CBT can help to promote medication compliance. Adverse outcomes of the disease are to be expected in older patients, patients with early disease onset, in cases with mixed symptoms or a high number of episodes, in patients with a family predisposition, or a chronic familiar or occupational stressor, or an existing comorbidity. Generally, however, affective disorders are manageable. A requirement for effective treatment is the active participation of the patient, which includes medication compliance and engagement in psychotherapeutic procedures. Correct answers can be found below the references. 1. A 45-year-old teacher consults her primary care physician with complaints about massive sleeping problems. She says she has been having these problems for years now, but recently, they have gotten worse to a degree that she is no longer able to fulfill her job requirements, which is why she asks her doctor for a sick leave. She is only sleeping 2 to 3 hours per night. Most of the times, she wakes up in the middle of the night, starting to brood and lying awake for the rest of the night. During the day, she feels exhausted, slack and without energy. It is worst in the morning while improving throughout the day and feeling best in the evening. She says to be desperate by now and no longer able to feel joy. She feels without energy during the day and has difficulty concentrating, which is why her teaching job feels like an overload. She is constantly nervous and feels like she is going crazy. During the day, especially in the morning, she feels sick and has already lost several pounds. She constantly feels like a loser, having done everything wrong in her entire life. Based on these reports, which of the following medication with sedative effect is, in addition to psychotherapy, a reasonable choice of treatment for this patient? 2. For a severe depressive episode according to ICD-10, which of the following symptoms is the least characteristic? American Psychatric Association, 2013. Diagnostic and statistical manual of mental disorders( 5th Edition). Washington,DC: American Psychatric association. Ebert, M. H., Loosen, P. H. & Nurcombe , B., 2000. Current Diagnosis and treatment in psychiatry.. New York: McGraws Hill. Murphy, M. J. & Cowan, R. L., 2004. Blueprints Psychiatry( 3rd edition). New York: Blackwell Publishing.